Today on the blog, is a very special newborn girl! First, a little history. Sage's mom, Laura, and I are best friends. We first met about 8 years ago. Laura was the manager at my tattoo shop, Positive Space Tattoo, and went to high school with my fiance, Adam. When I walked into the shop for my appointment, Adam and Laura started catching up while I started on my tattoo. After Laura and Adam were chatting, I found out that Laura and I had a lot in common, but one big thing: we shared the same birthday. HOWEVER, not only did we share the same birthday....we're the same age. We were born at the same hospital, only 20 minutes apart. How weird is that? We've since grown a strong friendship and say we're twins and soul sisters, because it just appears we were always meant to be friends! Laura has become a very special person in my life, and I'm so grateful for her friendship! I remember the day that I woke up to a text message from Laura, it was a photo of a pregnancy test that was positive! Her and her fiance John had started trying, and their dreams of becoming parents came true. I was ecstatic for both of them, and of course, I immediately started thinking of the newborn photos, especially once we found out the gender was a girl! Sage Moon was born on April 3, 2017 at 6:07PM weighing in at 9.2lbs! She's super healthy and beautiful! I'm so proud of Laura and John, who quickly have become amazing parents. Laura is a rockstar for having an entire plant-based vegan pregnancy too. Sage is amazing, healthy, and wonderful and Auntie Mallory is already so in love!! I will be taking thousands of photos of Sage as she grows, I mean, how could I not?! 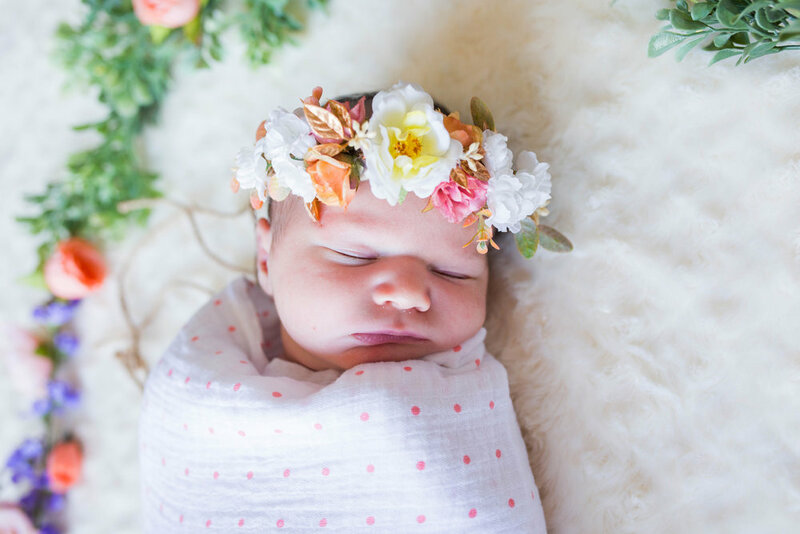 I had a blast coming up with some fun ideas for Sage's newborn photos... including a beautiful floral arrangement and music themed one! Here are some of my favorites from Sage's session!